Below are the books I read whilst away in East Africa. My Bible reading took me through Judges, Ruth, 1 & 2 Samuel during the week and Acts at the weekends. Walking among the maize fields as day was breaking, joining in with creation in praise of our creator and having fellowship with the God who is Father, Son and Holy Spirit will remain one of my abiding and favourite memories of the trip. How the News Makes Us Dumb - The Death of Wisdom in an Information Society. The title tells you exactly what the book is about - nothing cryptic there! Sommerville argues that we are addicted to news. The problem is that most of what passes as news is probably not significant in any real sense, it certainly doesn't alter our behaviour, it merely entertains us. He argues that we should read good books instead, something with less sensation, more rigour and more historical perspective on it. I'm not going to stop listening to Radio 4, but I feel like I am listening with a smidgen more discernment than before. A very amusing read. 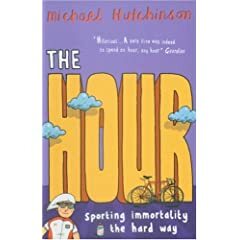 Michael Hutchinson recounts his attempt to break the record for the furthest distance travelled in one hour on a bike, with many anecdotes from the world and history of Cyclesport on the way. The tales he tells of the rivalry between Graham Obree and Chris Boardman had me in stitches. Whilst great fun to read, it reminded me that there is so much more to life than turning my legs into the best possible set of pistons I can. I took this book with me to see if I am a perfectionist or not. In general, I don't think so, I don't think I exhibit the kinds of controlling behaviours that the book outlines. However, in one or two areas, I have very high expectations of myself. Fear of failure in those areas then leads to procrastination, apathy and emotional paralysis. A reality check with Jesus and a little more honesty, humility and humour would go a long way to helping me get better at avoiding the more compulsive and negative elements of perfectionism. Probably my favourite book of all five. If our Western media are to be believed, the only things that ever go on in Africa are wars, dictatorship, coups, pillaging, corruption, disease and starvation. So with a breath of fresh air, Dowden, who has been an Africa journalist and correspondent for the last 30 years or so, aims at a dose of realism, giving us snapshots of a continent that exhibits shadows of both Heaven and Hell which, I must add, stand in sharp contrast to the shadows of Heaven and Hell we have gullibly cast in the West. He devotes a chapter each to about 15 different countries, (makes for clunking gear changes between each chapter), but also has some Pan-African chapters on AIDS, the legacy of Colonialism, The Rising Influence of China and the Impact of Mobile Phones. As far as I can tell, he has no particular religious convictions, but he did say the missionaries, despite their failures, have done more for Africa than the UN and all the NGOs combined. Something with which the great Matthew Parris would also seem agree! Schluter and Lee, explore as many have tried to do, a way forward out of the negative aspects of the global capitalist system in which we find ourselves - where the philosophy of choice reigns supreme (that choice - independent of any moderating factor - in and of itself is a good thing) - and do so without lurching into Communism or returning to the Dark Ages. They look at issues like - monopoly and how to break our obsession with size, political apathy/engagement, collective responsibility, civility and familial ties, by suggesting that we spend more of our time encountering real people in real space/time rather than people as mediated by a technological interface of some kind. V provocative and interesting read. They are available to borrow, you only need ask.